Welcome to the summer American Astronomical Society (AAS) meeting in Austin, Texas! Astrobites is attending the conference as usual, and we will report highlights from each day here. If you’d like to see more timely updates during the day, we encourage you to search the #aas230 hashtag on twitter. We’ll be posting once a day during the meeting, so be sure the visit the site often to catch all the news! Light curve of Kirkman’s eclipsing Cepheid variable showing the dual-modulation in brightness. Thomas Kirkman (St. John’s University) then shared a puzzling result he found with his group of undergraduate researchers. Their target of observation was an eclipsing Cepheid variable in the Milky Way (TYC 1031 1262 1). A Cepheid variable is a pulsating star that changes in brightness as it expands and contracts. When Cepheid variables are in binary systems, variability due to pulsation is complicated by eclipses by the dim star, adding another level of modulation in brightness (see the light curve in the figure). 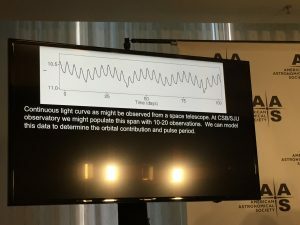 Kirkman and his group found that the binary system exhibited a decreasing period (took longer and longer to go around), whereas previous observers had found an increasing trend. These results suggest a puzzling oscillation in the orbital period — something that definitely calls for more follow-up! This afternoon, Chris Impey of University of Arizona gave a fiery overview of the history of space exploration, where we stand now, and where we’re headed in the future. 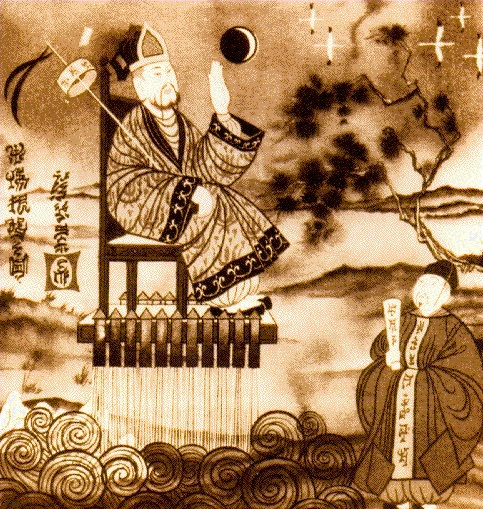 Impey opened with a summary of the alleged first space-travel attempt in 1550: a Chinese official attempted to travel to the Moon in a wicker chair with 47 rockets attached. Unsurprisingly, it didn’t end well. Though this story is almost certainly a fictional account, the same message came through again and again as Impey walked us through the space travel history of the 20th century: going to space is hard, astronaut mortality rates are high (3–4%), and we’re well aware of the challenges. Nevertheless, we continue to find this an endeavor worth tackling. Current prospects in the U.S. are looking progressively bleaker for government-driven space exploration. Past programs — like the Space Shuttle — are disappearing, and the budget for new programs is shrinking. The cost of space missions suddenly seems much more manageable when you change perspective, however: Impey made the unexpected comparison of space-mission costs relative to the production budget for major movies. Guess which one is, on average, larger today? So if you can front the money for a movie about going to space, why not instead front the money for the actual mission to space? This is the thinking behind the new private-sector-driven era of space exploration. Major companies like Space X and Blue Origin are putting themselves on the map, and programs like Google’s Lunar XPRIZE have encouraged an expanding field of players. Commercial space travel is becoming ever more prevalent; a total of 7 space tourists have gone up to spend a vacation at the ISS, for instance, paying millions of dollars for the privilege. And roughly two years ago marked the first time in our history that the majority of space launches to low-Earth orbit were commercial — a significant milestone. So what does the future hold? Impey believes that space exploration will continue to be driven primarily by the private sector. Some of his rapid-fire predictions for the future include successful asteroid mining endeavors, development of a permanent Mars colony, tourism to Europa, and exploration of Alpha Centauri. As for whether or not these things will actually come to pass — we’ll just have to wait and see. You can find out more about Impey in this interview by Amber Hornsby. 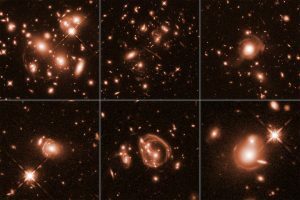 Ever since Galileo pointed the telescope to the sky and found the phases of Venus and the four satellites around Jupiter (and many more ground-breaking observations), we have been fascinated by the discoveries of celestial objects around us. By making a strong case for the existence of the yet-to-be-discovered Planet 9, Konstantin Batygin (Caltech) shared his efforts to “make our solar system great again”. The story started with the discovery of the Kuiper belt, a swarm of rocks going around the Sun beyond the orbit of Neptune. Most of these asteroids’ orbits can be understood with the eight planets we already have. However, when it comes to the bodies with periods longer than 4,000 years, their orbits are absurd — these long orbits seem to cluster together in space (the purple orbits in the figure), which is statistically extremely unlikely to occur by chance. It gets more and more intriguing as we have discovered more and more anomalies in our solar system. Sedna (2003 VB12) and Biden (2012 VP113) are two Kuiper belt objects with large orbits that never get too close to Neptune. Traditional theories on the early evolution of our solar system can’t explain the existence of such objects. 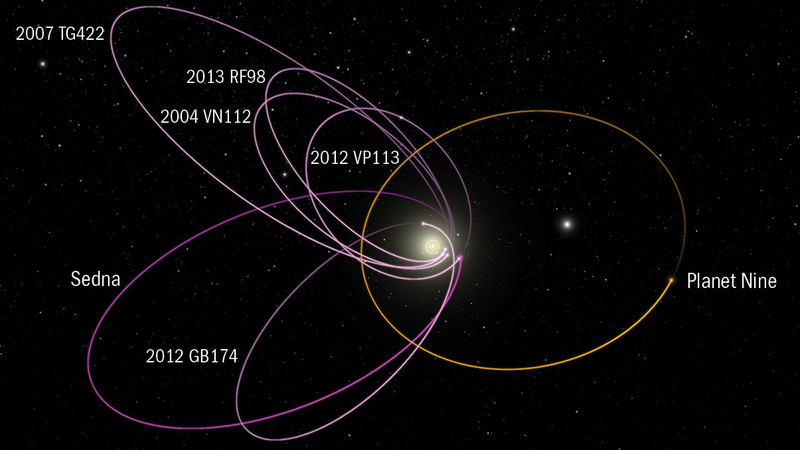 Kuiper belt objects have been discovered with orbits nearly perpendicular to typical planets. This also can’t be explained by our eight-planet solar system. A mysterious object called Niku was found to orbit the Sun with a retrograde (moving opposite to nearly everything else in the Solar system), near-circular, and extremely tilted orbit. The Sun’s rotational axis was found to have a 6° misalignment with the global orbital axis of the eight known major planets. All these “small enough to ignore, big enough to be relevant” anomalies could be explained by adding a planet with ~10 Earth masses in an orbit of ~500 AU — Planet 9! Using numerical simulations, Konstantin has successfully reproduced every single one of these anomalies. Whether we will find Planet 9 is still up in the air (in space I mean), but Konstantin’s remarkable discoveries have already made the Solar System great if you ask me! Konstantin is also a rockstar; don’t forget to check out his interview with Amber Hornsby. Did you know that our galaxy likely once hosted an active galactic nucleus? The Milky Way’s central supermassive black hole, the four-million-solar-mass Sgr A*, is much quieter today — but it still exhibits a little bit of action. Daniel Wang (University of Massachusetts) took the last plenary session of the day as an opportunity to catch us all up on some of the activity around the central black hole in our galaxy. Why do we care about Sgr A*? Besides the intrigue of learning about our local environment, Sgr A* has the benefit of being observable. 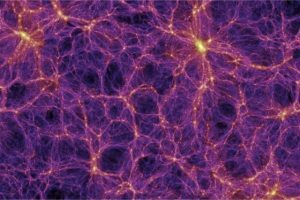 While the nuclei of other galaxies may be only a few pixels in our observations, we’re able to observe the central region of our galaxy on a broad range of scales. On arcminute scales, we can see the central star cluster and colliding stellar winds. Zooming in to a few arcseconds we can see the actual motion of stars as they orbit Sgr A*. And in the future, we hope to even get down to scales where we can resolve the shadow of the black hole itself, using effectively an Earth-sized telescope called the Event Horizon Telescope. What we learn about the center of the Milky Way by studying the region around Sgr A*, we can hopefully apply to understand the nuclei of more distant galaxies. Over the span of his talk, Wang introduced us to a number of studies of activity near Sgr A* — including both flares and quiescent emission. The bulk of Sgr A*’s quiescent emission comes from the outer regions around the black hole (i.e., 10,000–100,000 Schwarzschild radii away); this is in contrast to active galactic nuclei, in which the innermost regions dominate the emission. Interestingly, the outflow from Sgr A* very nearly balances the inflow, with less than 1% of the accreting matter actually falling into the black hole. Sgr A*’s activity becomes even more interesting when we look at its flaring behavior. We’ve observed about 100 X-ray flares total (mostly with Chandra, XMM-Newton, Swift, and NuSTAR), and we estimate that Sgr A* probably flares at a rate of about two times per day. These flares typically last only about an hour in X-rays. What causes them? 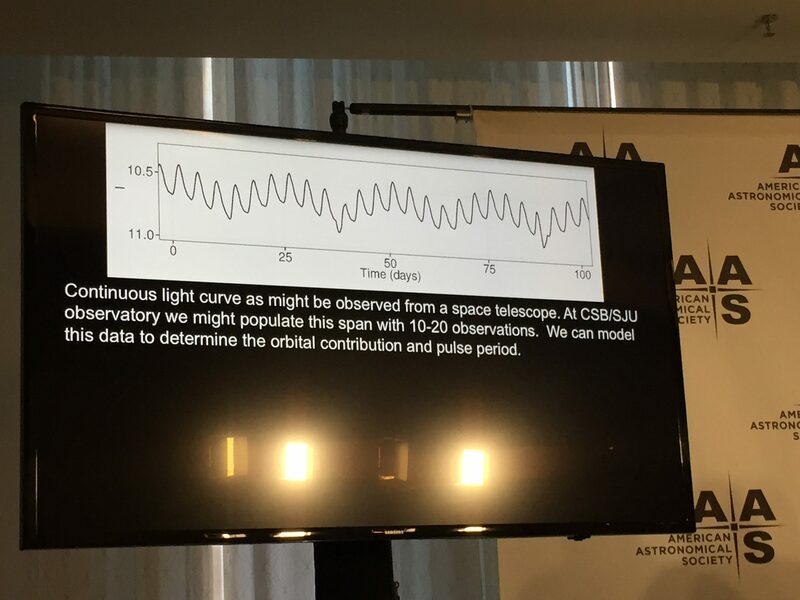 Wang presents two possibilities: the more mundane solution of magnetic reconnection (as is the case with solar flares), and the sexier alternative of tidal disruption of asteroids. The latter model fits the data slightly better in terms of the flare distributions and their durations, but the emission models haven’t been developed enough to say anything with certainty yet. To conclude, Wang walks through the big picture of the life cycle of galactic nuclear activity, which begins with cold gas accretion. This leads to star formation and resulting strong hot cluster winds, which then blow out the remaining cold gas and turn off accretion. When the winds weaken, the cycle can begin anew. This cycle is regularly interrupted by disruptions of passing asteroids, planets, stars, or dense clouds. You can read more about Wang in this interview by Chris Faesi.